Warthin's tumors which can easily be subjected to misinterpretation are encountered commonly in clinical practice. Warthin's tumors which generally have the localization of parotid gland cauda and have a slow growing characteristic can rarely be seen aside from parotid gland; such as cervical lymph nodes and minor salivary glands. 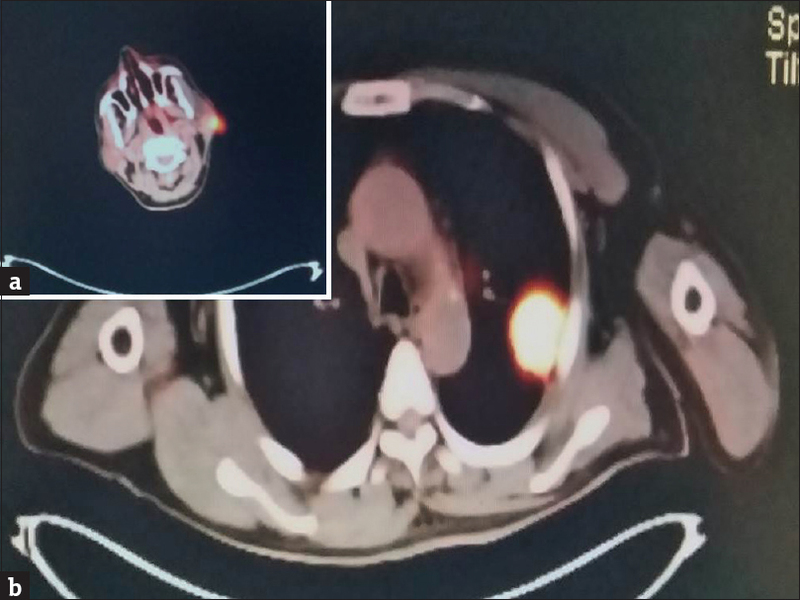 A 56-year-old patient's case that comprised atypical coexistence of Warthin tumor with PET/CT scan positive cervical lymph nodes during the diagnostic examination carried out for a pulmonary mass lesion is presented. While the transthoracic biopsy performed for the mass indicated non-small cell lung carcinoma, histopathologic diagnosis established for the lymph node reported Warthin tumor. Early detection of Warthin tumor may result in earlier diagnosis of lung cancer since patients with Warthin tumor have a higher risk of lung malignancy. This report discusses the diagnosis of a rare case of synchronous lesions of Warthin's tumor (WT) and lung cancer in the light of relevant literature on similar cases. Salivary gland neoplasms comprise 5% of all the head and neck neoplasms. WT, also known as adenolymphoma or papillary lymphomatous cystadenoma, is the second most common benign neoplasm of the parotid gland, comprising 15% of the parotid epithelial tumors. WT mainly arises from the parotid gland and generally settles in parotid gland cauda as a well-circumscribed, encapsulated lesion that contains cystic and solid components. A small percentage (15%–20%) of cases are bilateral or multifocal. Rarely seen in other locations such as the submandibular gland, cervical lymph nodes, or minor salivary glands, WTs are slow-growing and only few become malignant. Misdiagnosis of WT as metastatic disease, founded on only radiological imaging on patients with lung cancer, has been reported. A 56-year-old male patient presented to the outpatient clinic with complaints of cough and labored breathing throughout the previous month. He also had a gradually enlarging swelling on the left side of the neck which he had noticed since 4 months. He had a history of 30 pack/year of cigarette consumption. His physical examination showed subcutaneously located mass of 1 × 2 cm size and partially firm consistency below the left mandibular angle. Computerized tomography (CT) scan of the mass revealed a lesion with spiculation of 2 × 3 cm size in the upper lobe periphery of the left lung adjacent to the pleura and thorax. Considering that the lesion in the neck could be a metastatic lymph gland, the diagnostic positron emission tomography (PET)/CT scan carried out yielded pathological 18F-fluorodeoxy-D-glucose (FDG) values of 8.5 and 10.4, respectively, for the neck and the mass seen in the lung [Figure 1]. The PET/CT scan for the pulmonary mass also indicated positive cervical lymph nodes. It was decided to perform excisional biopsy for cervical lymphadenopathy. Histopathological examination of the excised lymph node showed a structural make up dissimilar to that of lung carcinoma and comprised a double row of epithelial papillae, cystic areas, and germinal center lymphoid tissue below the oncocytic epithelium, all complying with lymphomatous papillary cystadenoma or WT [Figure 2]. Following the nondiagnostic fiberoptic bronchoscopy, transthoracic percutaneous fine needle aspiration biopsy was carried out for the mass located in the left lung. Histopathological examination of the transthoracic biopsy performed for the mass indicated papillary predominant adenocarcinoma of the lung, documented as non-small cell lung carcinoma (NSCLC) bearing similarities to a poorly differentiated adenocarcinoma. The patient underwent a left upper lobectomy and mediastinal lymph node dissection. Mediastinal lymph glands did not show tumor cells. During the annual control of the patient, no relapse or metastasis was detected. Warthin Tumor is a benign neoplasm with an incidence of 2%–15% among all the parotid tumors and consists of condensed lymphoid stroma with glandular formation and a double-layered oncocytic epithelial component that histologically indicates a cystic and papillary structure. It is typically encountered during the fifth and sixth decades of life as a slow-growing tumor affecting males in general. Salivary glands are known to be the target organ of steroid hormones. Observations of significantly higher incidences of WT in males have lead to the proposal that this pathology is hormone-dependent. However, WT etiopathogenesis remains unclear, despite the fact that a hundred years have passed over its first description. It is assumed that environmental and/or genetic factors, metabolic and nutritional insufficiencies, and infections of chronic nature take part in the development of WT. It is also suggested that this particular tumor is associated with cigarette consumption. In the present case, the patient had 30 years of cigarette consumption history with the daily average of one pack. The potential for malignant transformation of the WT is approximately 1%. It is still a matter of debate whether the characteristics of slow growth rate, low recurrence, and malignant transformation ratios make WT a real neoplasia or not. It is classified by the World Health Organization as the “tumor-like lesions” of salivary glands. While in some studies WT can be observed synchronously with pleomorphic adenoma, malignant lymphoma, and various carcinomas, there are other studies that have shown the isolated existence of WT. It is known that 8% of all WTs have extraparotid localizations, the periparotid and upper cervical lymph nodes being the areas in which WTs are observed most commonly. Ultrasound, low-dose nonenhanced attenuation CT imaging and routine magnetic resonance imaging (MRI) could prove useful for indicating locations of focal lesions in the parotid gland. During the diagnostic stage, protocols such as routine MRI are usually inadequate. PET/CT with 18F-FDG have evolved as an invaluable tool in head and neck cancer imaging. To show the high glucose metabolism of the WT, 18F-FDG PET/CT scan should be used. Avidity of WT for FDG is found to be 6%–24%. In the particular case discussed here, SUV-max value of the lung mass was 10.2, whereas that of the cervical lymph nodes was 8.5, a value that is considered to be high for a metastatic lymph node. However, as it has been stated in the literature, it is in compliance with WTs' severe FDG engagement. Subsequent to FDG/PET scans, biopsy and histopathology yield the definitive conclusions with regard to the significance of the FDG uptake in the parotid lesions. The coexistence of lung cancer and WT is reported very rarely in the literature. A bilateral synchronous and multifocal WT case mimicking metastasis from lung cancer was reported by Dua et al., while two cases were reported by Thomas et al. Despite the fact that no association was proven, in a retrospective study carried out by White et al., it was suggested that among 144 patients diagnosed with WT, 24 (19%) of the patients suffered from accompanying lung cancer, NSCLC being the most common. The authors proposed that detection at an earlier stage for these lesions of benign nature may constitute a potential facilitation for early diagnosis of lung malignancies. Extraparotid localization of WT with intense FDG uptake is not adequate for definitive diagnosis, making a histological tissue diagnosis essential to exclude metastatic disease. Early detection of WT may result in earlier diagnosis of lung cancer since male patients with WT have been found to have a higher incidence of lung malignancy. Bussu F, Parrilla C, Rizzo D, Almador G, Paludetti G, Galli J. Clinical approach and treatment of benign and malignant parotid masses, personal experience. Acta Otorhinolaryngol Ital 2011;31:135-43. Naujoks C, Sproll C, Singh DD, Heikaus S, Depprich R, Kübler NR, et al. Bilateral multifocal Warthin's tumors in upper neck lymph nodes. Report of a case and brief review of the literature. Head Face Med 2012;3:8-11. Kızıl Y, Aydil U, Ekinci Ö, Dilci A, Köybaşıoǧlu A, Düzlü M, et al. Salivary gland tumors in Turkey: Demographic features and histopathological distribution of 510 patients. Indian J Otolaryngol Head Neck Surg 2013;65:112-20. White CK, Williams KA, Rodriguez-Figueora J, Langer CJ. Warthin's tumours and their relationship to lung cancer. Cancer Invest 2015;33:1-5. Teymoortash A, Krasnewicz Y, Werner JA. Clinical features of cystadenolymphoma (Warthin's tumor) of the parotid gland: A retrospective comparative study of 96 cases. Oral Oncol 2006;42:569-73. Peter Klussmann J, Wittekindt C, Florian Preuss S, Al Attab A, Schroeder U, Guntinas-Lichius O. 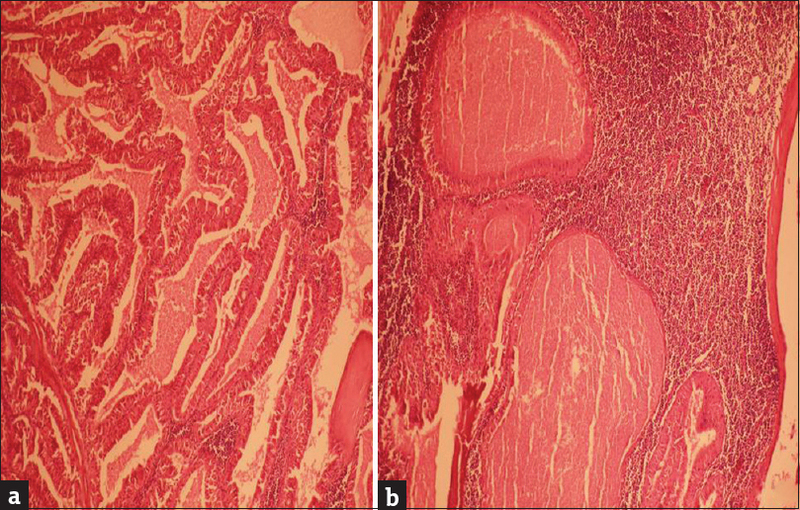 High risk for bilateral Warthin tumor in heavy smokers – Review of 185 cases. Acta Otolaryngol 2006;126:1213-7. Seifert G. Tumour-like lesions of the salivary glands. The new WHO classification. Pathol Res Pract 1992;188:836-46. Lee YYP, Wong KT, King AD, Ahuja AT. Imaging of salivary gland tumours. Eur J Radiol 2008;66:419-36. Dua SG, Purandare NC, Shah S, Rangarajan V. Bilateral synchronous and multifocal Warthis tumor mimicking metastasis from lung cancer: A rare cause of false positive flourodeoxy glucose positron emission tomograpy/computed tomography. Indian J Nucl Med 2012;27:139-40. Thomas R, Sharma N, Bruke C, Maxwell D, Howlett DC. Parotid incidentaloma detected during thoracic PET imaging: How should these lesions be managed? Br J Hosp Med 2010;71:292-3.